A major manufacturer, the company maintained a high standard and a quality stable of shapers 1960 - 1968. One of the original Brookvale Six - manufacturers with national sales and reputation. In October 2007, Mr. Denis Mc Donagh made contact by email and phone resulting in significant additions to this entry. Many thanks to Denis for his contrbutions.
'' Greg McDonagh is a hard-working, thinly-thatched bachelor of Brookvale, Sydney, and has been a board addict since he learned to swim at the age of fifteen. He pioneered the construction of boards in Australia from a foamed plastic core. 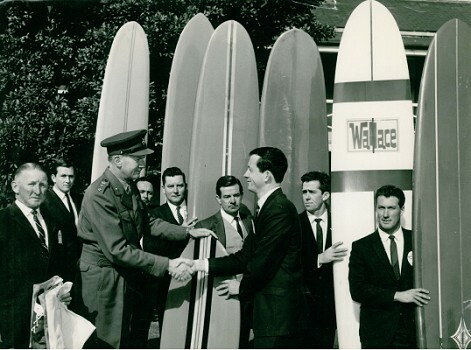 He built first his own hollow marine ply board and was forced into the industry because there was no one to make the newer Malibu-type boards in Australia. 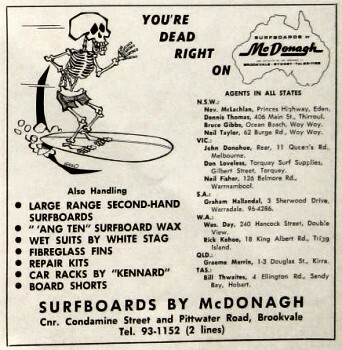 From a shed on the sand at Freshwater (Harbord) Beach, 6 feet tall, wide- shouldered, brown-haired McDonagh has progressed to a factory supplying boards in all Australian States. His business is flourishing so well office work is taking him away from the factory and surf more than he would like. 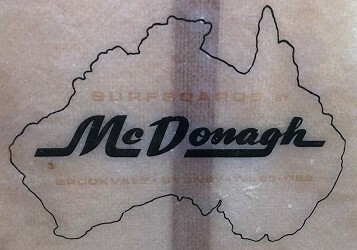 McDonagh's designs are the results of extensive tests by leading surfers over the past five years. He is constantly experimenting with board and fin shapes. McDonagh was one of the first to work on strengthening the early malibus, a joined balsa-wood plank, covered with a layer of fibreglass cloth. Pollard,1964. Chapter Seven pages 55 to 60. The first boards were built at Greg's house, one of two high on Harbord's north point, now the site of the Harbord Digger's Club. "Corner of Pittwater Road and Condamine Street"
Dennis had been working in New Guinea and was preparing to move on to Borneo when his was encouraged to return to Australia to help in the expanding surfboard business. The first factory in Brookvale was on the western side of Pittwater Road where the Warringah Mall is now located. Surfing World Volume 4 Number 6 August 1964, page 17. With the expansion of surfboard sales into large chain stores, Denis McDonald opens the first of his inner city surf shop at 411 George Street Sydney. Surf Dive n Ski Brochure, 411 George Street Sydney, circa 1965 (two pages, prices pre-decimal). Boardshorts from Platts Surf Wear. 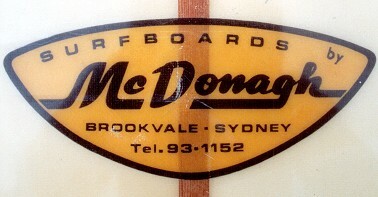 Surfboards by McDonagh, Bennett , Dale, Wallace and Keyo. As Surf, Dive and Ski (later SDS), the company expands at the rate of a new store per year for the next nine years. 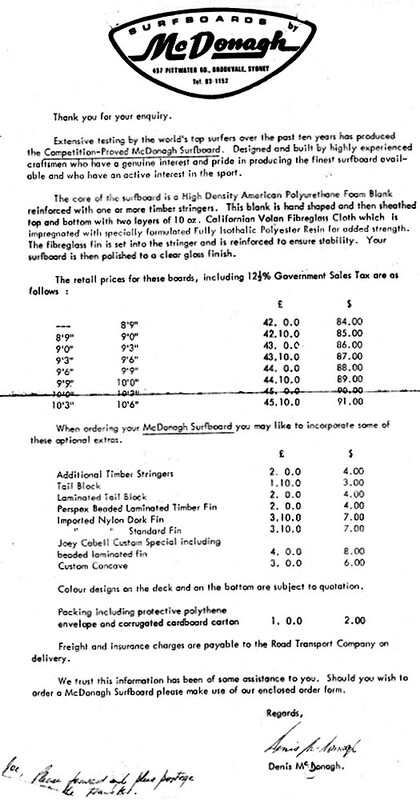 Aware of surfing conditions at Australian bases in South Vietnam from feedback by returned soldier/surfriders, Denis McDonald, in combination with other Brookvale manufacturers, arranges the donnation of surfboards and accessories to the Australian Army, see below. Double 10 oz Volan cloth. The fin is set into stringer. Dual prices (Pounds and dollars) indicate the decimalisation of Australian currency in 1966. Blue version, right, sent by Noddy H. May 2014. Note : There is no Tasmania in the decal. Surf Auction, Novemvber 2011, #90. 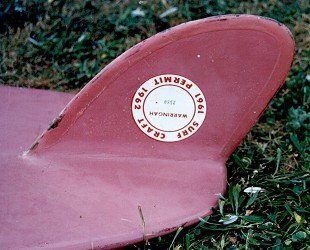 See bellyboard in image, bottom of this page. Probably one of the last by this manufacturer. Note fin set at pod and surf permit. 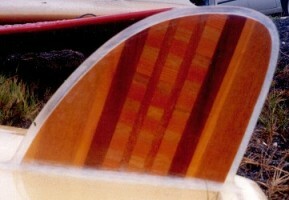 Multi laminate timber D fin with glass bead. Note: I had initially credited the representative of McDonagh Surfboards as "Greg" McDonagh. The person in the photo representing McDonagh surfboards was me. Greg & I worked in the manufacturing business and later started Surf Dive n Ski. The accreditation has been adjusted. Board-riding in South Vietnam during the war was dramatically illustrated in Francis Ford Coppala's Apocalypse Now (1979), where American marines were ordered into the waves while under fire in a demonstration of cultural superiority since "Charlie don't surf!" The script was by John Milius, the director of the 1978 Hollywood surf film Big Wednesday. 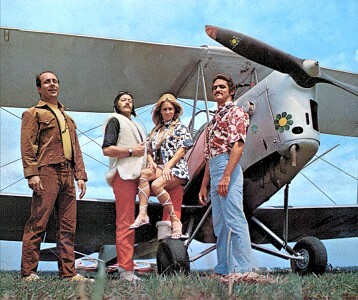 Surf Dive 'N Ski advertising photograph, 1969. Image courtesy of Dennis McDonagh. From left Other, Other, Tanya Binning, Dennis McDonagh. 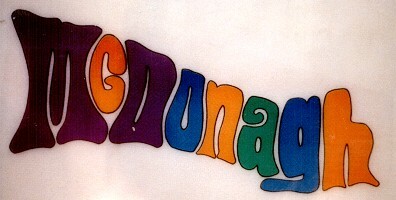 Volume 12 Number 2, 1969. In 1969 the company had stores in George Street Sydney, Roselands Shopping Centre and Warringah Mall Brookvale. Geoff Cater (2005-2019) : Catalogue : Manufacturer Index - McDonagh.